I’m struggling with these photos. I’m not a landscape photographer and I feel like I’m doing a disservice by posting photos that can’t possibly show you the beauty and scale of this landscape. I wish my photos could show you what it was like to sail through this narrow passage, surrounded by snow capped mountains and natural waterfalls. It was spectacular! It looks pretty spectacular to me! Beautiful photo, and your description of the narrow inlet is most helpful, too, Sage. Would you want to return to this region for a more in-depth experience? Is there a local Ferry serving these remote areas? I’m glad I went, but I don’t feel the need to go back. The scenery is amazing, but I live in Denmark, so going to Norway to me is almost like going from one region of the US to another. It doesn’t seem all that different. Of course there are differences in culture, etc. but there are also a lot of similarities in Scandinavia. Now that Denmark is “home,” Norway didn’t feel all that foreign. There are some local ferry services as well as some access roads to these areas, but it’s definitely not for the weak or pampered. The Vikings are hardy people! 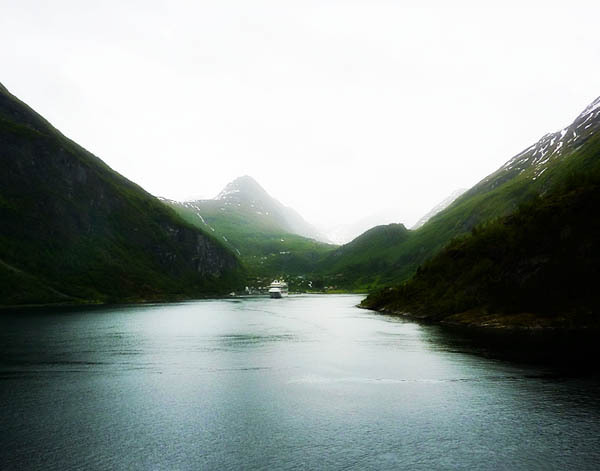 There are longer cruises that go farther up the coast, some even cross the Arctic Circle. That is interesting to me, but Europe is a big and amazing place, and my to-see list just keeps getting longer! I’m hoping to visit Amsterdam late summer/early fall, then it’s time to start planning my winter “exotic” trip. Hoping to fit in another European trip in late fall, too!